Scroll below for pre-recorded webinars and online video series. Subscribe to the Newsletter to be notified of upcoming live webinars. April 19, 2019. Scroll below for more information. Anyone can tell a story, but telling a story that makes a relevant point and gets results requires a deliberate story strategy. It requires an understanding of the art and science of storytelling. In this webinar workshop, Doug Stevenson, CSP, will show you how to use a story strategy to choose and develop effective stories for one-on-one, small group and keynote presentations. A personal story or business case study? “Doug pulled off the near-impossible – he channeled his in-person energy to the challenging venue of live Web training. From now on, in my own web presentations, I will shamelessly emulate his techniques.” – David Fink, Director of Training, Fujitsu General America, Inc. This is a LIVE Webinar. It will last for 75 minutes, including the Q&A. You will receive a PDF WORKBOOK and the link to join the Webinar 24 hours ahead of the Webinar. It WILL BE RECORDED and all registrants will get access to playback. 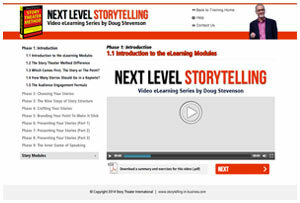 The Next Level Storytelling Video eLearning Series: Now you can learn the Story Theater Method with this instant access, self-paced, online video series. Click here to learn more. Please contact us for information on bulk purchases of this Video eLearning Series or installing it on your internal LMS. Anyone can tell a story, but telling a story that inspires people to change requires a different skillset. It requires craft, courage and vulnerability. It also requires the ability to share a deeper truth and to harness the power of emotion. In this three-part webinar workshop, Doug Stevenson will show you how to take your storytelling to the next level. Also includes pdf workbook for each session. Click here for the complete synopsis of this exciting 3-part webinar workshop series! Internal presentations at work can make or break a career. They not only communicate your content, but they also highlight your leadership ability and future potential. The ability to present yourself with confidence, poise and professionalism is essential to your success. It helps you get the buy-in you need when you make proposals or go for that promotion. The one thing that will slow you down, however, is to give a boring presentation that fails to make an emotional connection. The secret to making a real connection, while simultaneously delivering relevant content, is storytelling. It is widely accepted that stories work on many levels. They make a point, teach a lesson or sell a product, service or idea. But the right story will also sell YOU. If you want to make a positive impression that will be remembered for weeks, months or maybe years to come, one well-chosen and crafted story will do the trick. If you want that new assignment or promotion, step-out, stand-out and tell a story. But not just any story – it has to be the right story, that makes the right point, for the right presentation. In this 75-minute webinar workshop, you’ll learn how to find the right story using Doug’s Story Safari System. Then, you’ll learn how to craft the story using The Nine Steps of Story Structure. And finally, you’ll learn six essential presentation skills techniques that will allow you to present your story with confidence, clarity and focus. You’ll discover how to let your authentic self shine through, while also getting your point across. Set yourself apart by learning how to apply Storytelling at Work in your Internal Business Presentations. You’ll receive an email with access link, password, and pdf handout. In this webinar workshop you’ll learn how to find stories in everyday situations. You don’t need a life-threatening event to have a powerful story. The trick is to know what to look for, where to look for it and how to determine if the story is worth telling. Join Doug as he leads you on a Story Safari to find your meaningful stories. In no time, (or at least in 90 minutes), you’ll have the ability to find the story you need to make the point you want to make. You’ll identify stories that get lots of laughs and stories that are filled with emotion. You’ll identify stories that market and sell your product and services; and stories that explain who you are and what you do. Stories are everywhere. You just need to know where to look. Learn to find relevant and powerful stories in everyday situations, meaningful moments and more. You’ll receive an email with access link, password, and pdf handout. Subscribe to the Newsletter to be notified when new Webinars are released. CUSTOMIZED Webinars: Does your team need a customized live or recorded Webinar tailored to your organization’s storytelling needs? Contact us to discuss creating a Webinar training just for your group.